The US has agreed to make the cockpit video of the "friendly fire" death of a British soldier available to an inquest, Downing Street has said. The tape, obtained by the Sun, is said to show an American aircraft attack on a British convoy in Iraq in 2003. 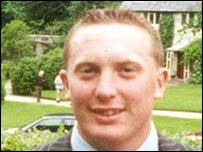 Lance Corporal of Horse Matty Hull, 25, from Berkshire, died in the attack. A row over the tape erupted last week when the coroner, Andrew Walker, attacked defence officials for failing to provide a copy to show the court. He was forced to adjourn the inquest in frustration at the failure by the Ministry of Defence (MoD) to get the permission of the US authorities to use the recording in evidence. L/CoH Matty Hull's widow has also said she was told no video existed, although the MoD said it had simply not mentioned the video to her. A coroner's clerk told the BBC he had been informed on Tuesday that the US would allow it to be shown - but on condition it was seen only by the coroner and the Hull family under supervision by an MoD official, and that the press were not present. Defence Secretary Des Browne said the move to release the tape was "the right thing to do". Shadow defence secretary Liam Fox said there were a number of questions which needed answering. "The public will want to know what the government is doing to prevent such 'blue on blue' incidents happening in future," he said. "We need to know what arrangements are in place for the proper sharing of information with the US authorities relating to these unfortunate events, to enable us to learn all the facts of the situation." Liberal Democrat leader Sir Menzies Campbell said the pilots involved should go to the inquest. "The government must commit to giving families the full facts surrounding the death of any member of the armed forces, however painful this may be," he added. Before the Downing Street statement, L/CoH Hull's widow Susan said the video was "vital evidence and must be shown" at an inquest. "The inquest is my one and only chance to hear how and why Matty died," she said. She added that she would have preferred to hear the evidence from the US pilots themselves, but they could not be compelled to come and had not come voluntarily. The attack from the US A-10 "tankbuster" aircraft reportedly killed L/CoH Hull, from the Household Cavalry Regiment, and injured four others near the southern Iraqi city of Basra. At the start of the attack in the video obtained by the paper, one pilot notices orange panels on the vehicles and asks whether there could be any friendly units in the area. His command gives assurances there are no coalition forces in the area. Pilots open fire but soon the error is realised and they are informed friendly units were in the area - and an air controller says it is reported that one person has been killed and one wounded. One pilot replies: "Copy. RTB [return to base]." A colleague says: "I'm going to be sick." "We're in jail, dude," says the first pilot. The Pentagon said no disciplinary action had been taken towards the two American pilots involved in the incident. It said an official US investigation in 2003 concluded the pilots' actions were not reckless and that they reasonably believed they were engaging an enemy target. The MoD admitted withholding some classified material but stressed there had been no intention to deceive or mislead. BBC News security correspondent Frank Gardner said the release of the video had been "deeply embarrassing" to the MoD and the Pentagon. He said: "This was an error, friendly forces got killed because of mistakes both high and lower down the chain of command." It is not known who leaked the video to the newspaper, but a spokesman for the US Central Command said it was "regrettable" that the video was now in the public domain. Major David Small said the military did not mind declassifying the tape for the inquest, but did not wish everyone to be able to see it because it could help America's enemies.